Bluefish are primarily targeted recreationally, although a small commercial fishery exists. Landings of bluefish peaked in 1986 before a steep decline. A 9-year management plan was set in 2000, and the stock was rebuilt by 2009. In 2010, about 7 million pounds of bluefish were landed. 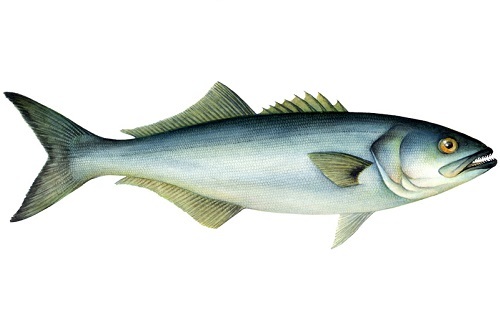 Bluefish caught by handline represent up to 5% of the fishery. Bluefish have a history of being overfished, although due to a successful management plan, the stock rebuilt in 2009 and is still currently healthy despite a slight decline in recent years. An updated stock assessment is planned for 2014. Management of the bluefish is highly effective. Successful management rebuilt the population in 2009 and has maintained abundance. Scientific advice is used by managers, and regulations such as quotas are enforced. Handlines cause minimal to no bycatch. They also do not touch the seafloor and therefore cause minimal habitat damage. The bluefish plays an exceptionally important dual role in the ecosystem as both a predator and as prey. The impact of its removal from the ecosystem is unknown, although management is currently investigating ecosystem-based management. Gillnets and trawls cause the bycatch of several species including marine mammals and sea turtles. Gillnets are most prone to entangling several species of whales and sea turtles when their use coincides with migration season. Bottom trawls most often catch sea turtles as bycatch, although the use of turtle excluder devices can reduce this amount. Bottom gillnets have the potential to damage habitat when the weights make contact with the sea floor. Bottom gillnets are most damaging on rocky or reef substrate, and although bluefish reside in areas with muddy or sandy substrate, damage is still possible. The bluefish plays an exceptionally important dual role in the ecosystem as both a predator and as prey. The impact of its removal from the ecosystem is unknown, although management is currently investigating ecosystem-based management.